When Morgan Sanderson left her grandparents’ anniversary party, she had no idea how much the previous week would impact her life. Four years later she’s living a content life, teaching literature and being the best mom she can be, even if she knows something is missing. That thing being the one person she can’t forgive and yet can’t get over. The week Ryan Cartwright spent with Morgan was the best week of his life until tragedy struck, one that changed his life completely. Four years later he discovers he has three year old twins with Morgan, the one woman he’s never been able to forget and let go. Can he forgive her from keeping the knowledge of his sons from him? As they uncover the truth behind their separation, they discover the love they’ve always felt for each other is still there, but can they ever trust each other again? How would you feel if you met the love of your life when you weren’t looking for it? What if you found them, spent the best week of your life with them and had them have to leave unexpectedly? What if you didn’t have their contact information and found out you were pregnant? Imagine all this and mistaken identity that causes a ton of heartache to get this story. Morgan is content being on the outside away from all the crowd at her grandparent’s house when she runs in to a man who not only brings her out of her exile but makes her feel things that she doesn’t quite know what to do with. They have an incredible week when he is called out of town unexpectedly. After he leaves she realizes they don’t have each others contact information plus he has the wrong last name for her. You see her family has been burned before with the whole gold-digger thing so she used a false last name with him out of habit. After she finds out that their one time together has left her pregnant she wants to find him but at a fundraising party later that same day she sees a man that seems to be her prince wooing another woman and acting like he’s never met her before in her life. 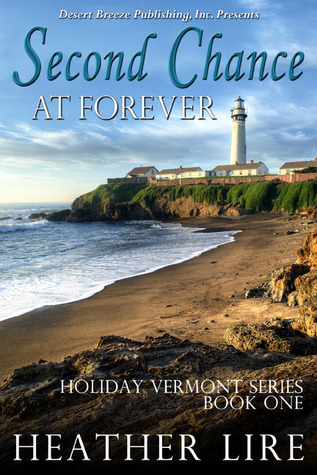 Devastated she decides to not try to tell him and move on with her life in small town, Holiday, Vermont. A few years pass before she gets a message that he knows about his sons and is probably on his way to confront her plus meet them. Ryan was stunned to find the woman he has been unable to forget since their one week together but has never been able to track her down until his twin (identical) brother informs him that he not only knows where she is but that he is a father. You see he only left on such short notice because of a tragedy that has resulted in he and Evan raising two little girls. He’s shocked to find out that he’s a father and honestly even though he isn’t happy about missing out on so much he’s excited to see the woman he never forgot. When he sees her again he knows that she is it for him and the feelings that he had from that one week together were real and worth pursuing. He’s also at a bit of a crossroads in his life as he’s not sure that he can put himself in the dangerous situations he does every day in his job as a big city cop. He works very hard to earn Morgan’s trust back and be patient as she works to let him back in. I have to say I loved both of them as they struggled to reconnect at decide to take a chance on something amazingly rare. They really did connect in that single week and being back together after so much time apart but feeling like the time had never happened showed them it was real. It was believable when Morgan struggled to commit fully and take that jump to trust in her heart but I loved it. I loved how Ryan was so strong in his conviction that she was everything to him and that he let her take the time she needed to make up her mind even though it did hurt him. He’s such a good man and the fact that he really understood where she was coming from was beautiful to see. This is a heartwarming story even with the initial heartbreak. I mean I wanted to strangle the man we thought was Ryan early in the story. I’ll definitely keep my eye out for more from Heather and cannot thank her enough for taking a chance on me. She was daring enough to send me an email to see if I would like to read this for review with no expectations that I would like it let alone love it. I adored it and would gladly recommend it to anyone who likes reunion stories or true love stories.